George Brassens, “La mauvaise herbe”. Hobbo era un gran villaggio. I raccolti erano sempre abbondanti. Gli abitanti vivevano bene. Il giovane Koni ha lasciato il suo villaggio quando le cose andavano bene. È andato ad apprendere le tecniche dell’agricoltura. È partito per la grande scuola di Ba-Illi. Ora ha terminato i suoi studi ed è ritornato al villaggio. Ma lì nulla è come prima, il villaggio sembra morto e vuoto. Koni allora va a trovare il vecchio Kimsou per sapere cosa c’è che non va.
Koni arriva dal vecchio Kimsou e gli domanda cosa è successo. Lo striga è un erba cattiva. Cresce nei campi di miglio, di sorgo, di mais, di canna da zucchero e di fagioli. Cresce anche nei campi a riposo, tra le alte erbe. È una pianta parassita. Quando lo striga fissa le sue radici a quella della pianta ospite, esaurisce tutto il suo nutrimento. Infatti lo striga preleva tutti i sali minerali e l’acqua che salgono sulla pianta. Quando lo striga germina e cresce è molto pericoloso per le piante coltivate. Le piante colpite divengono deboli perché lo striga gli succhia la linfa come la zecca succhia il sangue degli animali. Le distanze tra i nodi divengono corte, le foglie rimpiccioliscono e ingialliscono, le piante seccano o restano di piccola taglia. Le spighe rimangono piccole e contengono pochissimi grani. Alla fine lo striga distrugge quasi tutto il raccolto. In Tchad e nel Cameroun del nord lo striga distrugge più della metà dei raccolti. Tratto da: “Comment lutter contre le striga? Striga, commonly known as witchweed, is a genus of 28 species of parasitic plants that occur naturally in parts of Africa and Asia. The genus is classified in the family Orobanchaceae, although older classifications place it in the Scrophulariaceae. 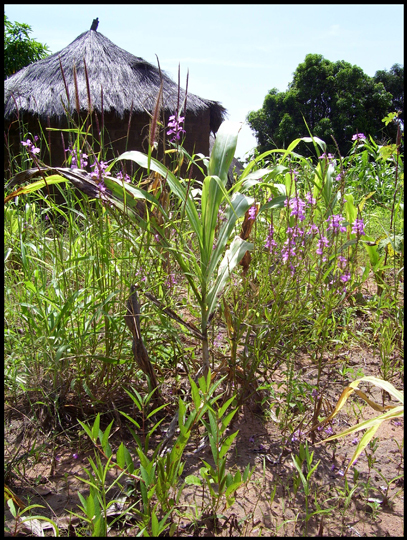 Although most species of Striga are not pathogens that affect human agriculture, some species have devastating effects upon crops, particularly those planted by subsistence farmers. Three species cause the most damage: Striga asiatica, S. gesnerioides, and S. hermonthica. Striga asiatica has a very wide geographic distribution, from Africa through southern and eastern Asia to Australia. Since the 1950s it is also known from the United States. This introduction, likely a result of human activity, resulted in an infestation of corn (maize, Zea) across many counties in North and South Carolina. The United States Department of Agriculture and state agencies imposed a quarantine on this area to control its spread - a process that was apparently successful. 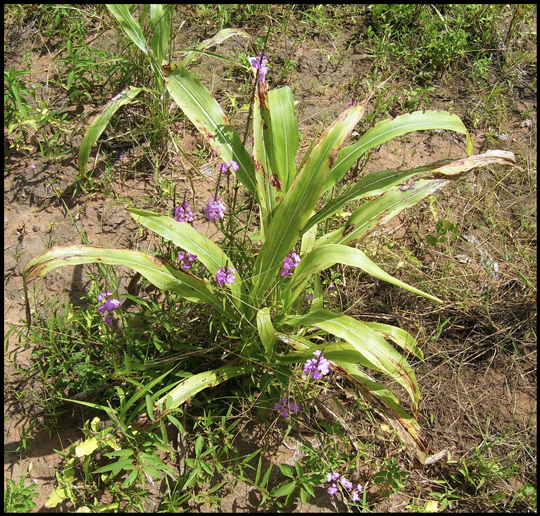 Striga hermonthica (purple witchweed) is also a parasite that affects grasses, particularly sorghum and pearl millet in subsaharan Africa. Cowpea witchweed, as its name implies, is a parasite of cowpea (Vigna unguiculata), which is not a grass but a member of the legume family (Fabaceae or Leguminosae). This species was also accidentally introduced into Florida in the United States where it was found parasitizing Indigofera hirsuta (hairy indigo, another legume). Striga in the United States was controlled through the use of several management stategies, including quarantines imposed on affected areas, control of movement of farm equipment between infected and noninfected areas, herbicide application, and imposed "suicidal germination." For the latter, in fields not yet planted in crops, seeds present in the soil are induced to germinate by injecting ethylene gas which mimics the natural physiological response tied to host recognition. Because no host roots are available, the seedlings die. Unfortunately, each Striga plant can produce tens of thousands of tiny seeds and these can remain dormant in the soil for many years. Thus, such treatments do not remove all seeds from the soil. Moreover, this method is expensive and not generally available to many farmers in developing nations of Africa and Asia. Another method called trap cropping involves planting a species in an infested field that will induce the Striga seeds to germinate but will not support attachment of the parasite. This method has been used in sorghum plantations by planting Celosia argentea between the sorghum. Planting silverleaf (Desmodium uncinatum) has worked in maize crops. Coating maize seeds with fungi or a herbicide also appear to be promising approaches. * Striga aequinoctialis W. Africa. * Striga angustifolia E. Africa, Asia, Indonesia. * Striga asiatica (Asiatic witchweed) Africa, Arabian peninsula, India, Burma, China, Indonesia, Philippines, Malaysia, New Guinea, Australia (introduced? ), USA (introduced). * Striga chrysantha Central Africa. * Striga dalzielii W. Africa. * Striga elegans Angola, Malawi, South Africa, Zimbabwe. * Striga forbesii Africa, Madagascar. * Striga gastonii Chad and Central African Republic. * Striga gesnerioides (cowpea witchweed) Africa, Arabian peninsula, India, USA (introduced). * Striga hallaei Gabon, Democratic Rebublic of Congo. * Striga hermonthica (purple witchweed) Senegal to Ethiopia, Democratic Republic of Congo and Tanzania, Angola, Namibia. * Striga junodii SouthAfrica, Mozambique. * Striga klingii W. Africa, Nigeria, Ghana, Cameroon, Togo. * Striga latericea E. Africa, Ethiopia, Somalia. * Striga lepidagathidis Senegal, Guinea, Guinea Bissau. * Striga lutea Sudan, Ethiopia. 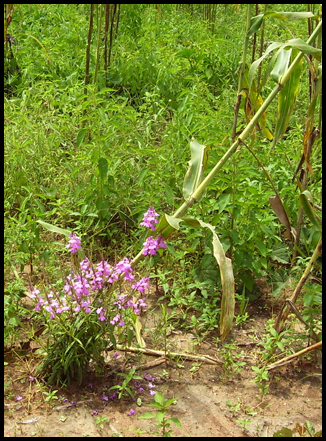 * Striga macrantha W. Africa, Nigeria, Ivory Coast, Togo. * Striga passargei W. & C. Africa, Arabian peninsula (?). * Striga primuloides Ivory Coast, Nigeria.